Crap Email From A Dude: "The Unsteady Seating Of Mirrors"
You date a guy for two months; it's okay. When he abruptly cuts off contact, after a week you send him a 3-line email ending things. Ah, but he has to have the last word. And what last words. I do apologize for not speaking. I've been mentally and emotionally taxed these past two weeks, and allowing our new relationship to languish was a regretable but simple choice. Our connection had the unsteady seating of mirrors and physical pleasure. 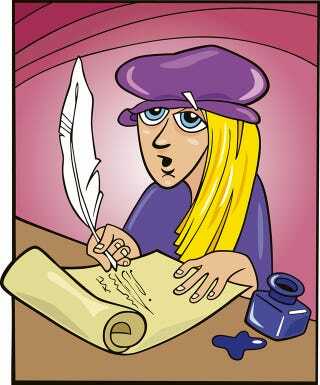 I enjoyed seeing a writerly life in another, but im too egotistical to mix it with real romantic admiration. I suppose all this explaining is dwarfed by my recent inaction. I wont be willing to make up for this offense beyond an apology. Im sorry kc. Im still a bit in the dumps and am just looking out for myself right now. With what little foresight I have today, I don't see sharing correspondances or adventures anymore. I wish you the best and please consider the book a gift. As K.C. (who, as she notes, "capitalize my name like anyone else" ) observes, "he fancies himself a poet." Which explains the e.e. cummings punctuation — and the book — if not the "unsteady seating of mirrors and physical pleasure," which we can only assume is some reference to self-reflection, Barbra Streisand, or insecurely-hung looking-glasses. Either way, as our correspondent says, "Spare us all, just say you're not interested."